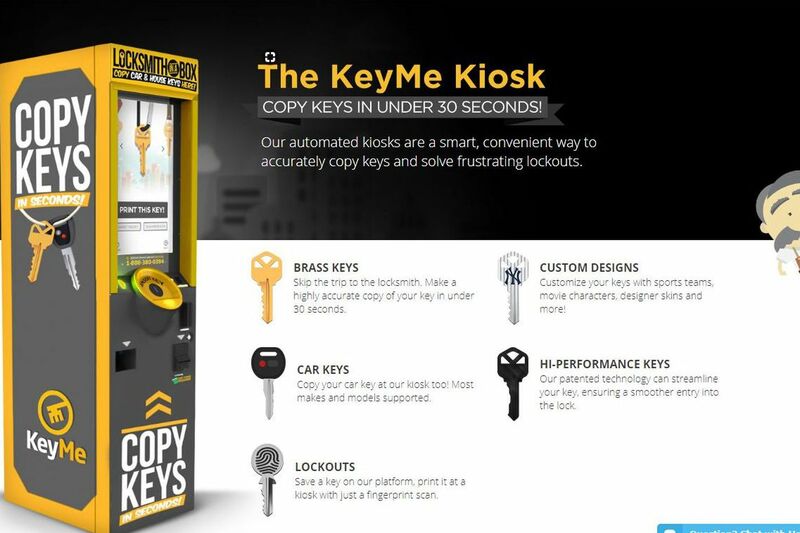 KeyMe offers both self-service key-copying machines and special scanning technology for sharing and remotely duplicating keys. Self-service key-making machines have popped up in recent years at retail stores. With a sizable investment, Comcast Ventures is keying into a clever cut-up called KeyMe that seems the "smartest" of the bunch, not all that far removed from the home-security and automation products offered under the Comcast Home banner. With the new $25 million investment led by Comcast's start-up-funding arm, KeyMe has raised more than $100 million since 2012 and is "seriously disrupting the $7.5 billion locksmith industry," founder/CEO Greg Marsh said. As with rivals Copy Your Key at Lowe's, LaserKey at Home Depot, and MinuteKey at Walmart, consumers might first encounter KeyMe as a touch-screen machine into which you insert a key and quickly get it copied with a basic ($3) or pricier ($4 to $5) decorative key head design carved by "advanced robotics." Home, office, mailbox, Mul-T-Lock, some Medeco, and "over 70 percent of car keys" can be duplicated, KeyMe says. But unlike its competitors, KeyMe also has brains, a smartphone app, and cloud connectivity that open up other applications. For instance, once a key has been inserted, traced, and tagged ("Shore house") at a kiosk, the information is securely stored and linked to a machine-nabbed fingerprint and credit card. A key owner can then return for more copies with just a reapplication of that fingerprint and a card swipe. KeyMe also works with a free mobile app – available for iOS in the App store, or for Android devices at Google Play — and the camera in your smartphone/tablet. Lay the key to be copied on a white background, position the camera lens four inches away, and snap a picture. Copy the key's rear side, too. The smart app identifies the key's type and distinct setting code, the depths of cut for each key notch. With the key ID info recorded, it's easy to order copies from KeyMe for mail delivery, or to enter the numbers at a KeyMe kiosk, or to give the code to a locksmith to dial in the settings on a special key-making machine. Old-school hardware stores such as East Passayunk Avenue's Cohen & Co. "still need a physical key to run off a copy," cautioned proprietor Mitchell Cohen. More than 1,000 KeyMe locations have already been established, Marsh said. And with the new Series D funding from Comcast Ventures, Battery Ventures, Benefit Street Partners, Michael Polsky, Questmark Partners, Ravin Gandhi, RiverPark Ventures, 7-Eleven, and White Star Capital, KeyMe will finish "2017 at more than five times the number of kiosks" than when the year began, he said. Comcast Corp. invested last week in the Internet of Things security-monitoring company Bastille, joining a $27 million growth-funding round. To ward off the scourge of hackers tapping into the WiFi radios of internet-connected devices, computers and mobile phones, Bastille is commercializing a sensor-based threat-detection system – initially for corporate and government environments – that sniffs when rogue operatives are breaking into conversations, tapping into poorly secured access points. Taking out compromised home-security cameras and smart TVs might not be far behind.